Calgary: The West Hillhurst assembly announced a 10 night gospel tent series from July 8-17 at Forest Place with John Fitzpatrick and Bert Snippe. Fort McMurray: The Wood Buffalo assembly is grateful for the prayers of the Lord’s people and practical assistance in the aftermath of the wildfire that swept across the city in early May. Since their rented accommodation was destroyed, they have rented a room for two hours on Sunday morning and one hour on Wednesday evening until the new hall under construction is complete. With all the reconstruction that is going on, it is difficult to find tradespeople, but the local brethren are doing all that they can toward finishing the hall. Deep Cove: Gospel meetings are planned to start in the will of the Lord on September 11 with David Hunt and Stuart Thompson. Please pray for these meetings. Kamloops: The annual conference went well. The Lord gave help in the ministry of His Word by Ian Gibson (Winnipeg, MB), John Fitzpatrick (Corvallis, OR), Steve Meyers (Marysville, WA), Mark Richards (Edmonton, AB), and Dave Richards (Kamloops). The Westsyde saints were encouraged by the number attending. 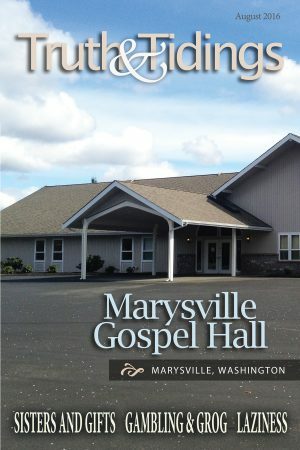 The ministry is available at westsydegospelhall.com. Vancouver: The South Main Street assembly set up a literature display on April 16 in front of the hall for the benefit of crowds that passed by for the annual Vaisakhi Parade sponsored by the South Asian community. The display was set up for four hours and hospitality was extended from the hall. It was a friendly atmosphere and a nice opportunity for young Christians to witness. Please pray for the gospel tent at the annual Pacific National Exhibition which runs for 15 days in late August. This is supported by local assemblies and God has blessed over the years. Pray also for several summer children’s works throughout the city in July and August, some in halls and some in parks. Englehart: The June conference sponsored by the four area assemblies was well attended and the ministry by Larry Buote, Allan Clark, Bryan Joyce, Brian Kember, Shawn Markle, Murray Pratt, and Bruce Rodgers was appreciated. Larry Buote gave ministry in the area the following week. Mississauga: The Applewood Heights assembly has been encouraged with recent reports and ministry from brethren Pablo Segual, giving a report on Chile, and Shawn St. Clair, giving a report on the new work in Cornwall, ON. Toronto: The Agincourt assembly has been encouraged lately with spiritual progress shown by some teens. One teenager was added to the fellowship in May and three teens were baptized in June. Springdale: The annual conference was held in June with believers arriving from various parts of the country. Appreciated help in the gospel and ministry was given by Tom Baker, Isaiah Frazier, Anderson Hernández, Melvin Mendez, and Dr. Eliseo Rojas. Newington: The assembly had three weeks of gospel tent meetings in June with Gene Higgins. There was excellent attendance and power in the gospel preaching. There were many unsaved who attended and the Lord blessed in salvation, with five professing faith in Christ. One was an elderly woman who discovered that she had been deceived by her religious leaders all of her life, and the mother of a Sunday school girl professed on the last night of the meetings. Saugus: The Ministry & Bible Reading Conference was fairly well attended. Brethren J. Dennison, L. Parks, and A. Ussher were responsible for the ministry and readings and for the gospel as well. The Lord gave help to the brethren in handling the subject of “Marriage and the Family” as evidenced by the attentiveness and the participation of those in attendance. Recordings of the sessions are available at www.walnutstreetgospelhall.com. During the month, Dan Shutt was available for the gospel at the community Father’s Day dinner and also for the rehab center meeting. Matthew Cain also visited for one evening in ministry. Battle Creek: The Christians appreciated a visit from Stu Thompson in June. Jackson: Please pray for gospel tent meetings to begin August 1 with Al Christopherson and Joseph Baker. Fridley: Early in June, Robert Surgenor covered a lot of good ground (doctrine and exhortation) ministering on 1 Thessalonians for six nights and one Lord’s Day. Later in June, Roy Weber and Jerry Jennings began a series of gospel meetings. None have professed at the time of this note, but 14 children linked with the saints have attended. Pennsauken: Tent meetings were held from June 5 – July 3 with Peter Ramsay and Kyle Wilson. God blessed in salvation and the meetings were a great encouragement to all. Crandon: The assembly joyfully received a young sister into the fellowship and is also planning to baptize two other young believers. Beetown: Lord willing, William Lavery and Brandon Doll plan to have gospel meetings at the Beetown Gospel Hall for at least two weeks, or longer, July 24 through August 5. Cancún: The believers very much enjoyed a visit from Paul and Barb Thiessen in June. Paul had five nights of encouraging and edifying ministry. Veracruz: The assembly had a week of well-attended children’s meetings in June. A married couple from the nearby outreach work in Hatito was baptized. A monthly visit to Coscomatepec recently resulted in fruit in the salvation of a man who had been attending for some time. Netzahualcoyotl: Raúl Martínez preached the gospel to a number of people present to witness the baptism of four believers. Puerto Vallarta: The Coapinole assembly had the joy of receiving a brother and sister into fellowship. A work at the Regional Hospital began recently; each Friday, the believers hand out tracts and food, and preach the gospel to those in the area. Guasave: The new assembly here enjoyed a visit for several days from Tim Woodford while Leonel Chávez visited the work in El Vergel, Chihuahua, along with Shad Kember. A young sister was baptized in Guasave in June. Pablo Mendoza from the assembly here spent more than two months in the hospital waiting for surgery on his back which finally was performed at the end of June. Ciudad Obregón: The assembly held three weeks of gospel meetings in June. Shad Kember was helped by local brothers for the first two weeks, and then Leonel Chávez came for the third week. They are thankful for the blessing of God upon His Word. Hermosillo: On June 17, God called Fransisco Olguin home at the age of 60. Only a few weeks prior he had been given a diagnosis of cancer. He and his wife Manuela were saved in 2007, and he later lost his eyesight due to diabetes. He said that he never had seen things so clearly as he did once he lost his sight. Their grown children are not saved, and had never shown any interest in the gospel, but were impressed with the tranquility with which Francisco faced his impending death, and also with the way the funeral at the hall was handled. Tim Woodford and Shad Kember preached the gospel to a full hall, many of whom had never been there before despite being invited by Francisco during his life. Chihuahua: A gospel series in the Porvenir hall commenced on June 28. Monterrey: Anderson and Mariu Hernández began renting a hall in the Benito Juárez area on the east side of this large city. Anderson is preaching the gospel twice a week here with plans to have a series this summer. On Lord’s Day, there is a Sunday school and gospel meeting in the Lázaro Cárdenas neighborhood. Ballinaloob: For two weeks, the assembly had gospel meetings in a local Community Centre where W. Brown and L. Craig clearly presented the gospel. Local response was mixed, but the meetings were blessed with news of salvation. Ballybollan: The assembly conducted gospel meetings in the Hillstown Hall during May, with brethren Robert Plant and Samuel Chesney preaching. Local assemblies supported in this rural area and all were encouraged by the Lord blessing in salvation. Ballymena: In the month of June, John Rogers and Wesley Martin had well-attended gospel meetings in a large tent erected outside the town. There was joy in seeing the Lord’s hand in blessing. Randallstown: The assembly at Clonkeen recently had the Bible Exhibition for one week, when 400+ children, representing 14 schools from the surrounding area, attended and were presented with the gospel, along with their teachers. Dunmurry: In the Seymour Hill estate, the assembly erected a portable hall, with Andrew Steele and Tom Armstrong faithfully preaching the gospel. The meetings continued for the month of June and blessing in salvation brought encouragement. Kilkeel: S. Nelson and K. Newell conducted a series of gospel meeting in the gospel hall, with some local interest. Those who have heard so much, so often, seemed to be unmoved by the clear preaching. Newry: The assembly held the Bible Exhibition for one week at the end of June where 600+ children and a good number of teachers visited and heard Bible truths, some for the first time. Claudy: The assemblies at Straid and Donemana held a series of gospel meetings for seven weeks in a portable hall in Claudy village, with an encouraging number from the surrounding area attending. The Lord blessed in salvation. Portstewart: In the local primary school, P. McCauley and D. Williamson had four weeks of gospel meetings. The meetings were supported by surrounding assemblies and God blessed in salvation. Kilmore: The assembly has had a number of weeks of gospel meetings in a portable hall between Drumquin and Castlederg. Stephen Gilfillan and David Straghan have been laboring here where the gospel has not been presented for many years. During this holiday period, a number of conferences are arranged annually, July 12 being a public holiday. Conferences were scheduled at Ballybollan (Co Antrim), Kingsmills (Co Londonderry) and Kingsmills (Co Tyrone), with Ballymagarick (Co Down) on July 13. In Bushmills, the local assembly annually arranges two weeks of Bible readings using the high school assembly hall. The Bible readings are from July 11-22. Many believers on holiday on the north coast attend, while others travel from their local areas. Generally, over 400 gather each evening around the word of God. Each morning, open-air meetings are conducted in Portrush during these two weeks, and many gospel tracts are distributed. Western Siberia: This Spring, J. Fitch and L. Smith gave teaching in four of five assemblies. The authorities allow teaching in the local church, but not public evangelism. International sanctions have increased hardships for the people and hostility toward western foreigners. More than ever, please pray for local believers to spread the gospel, for elders gifted to teach, and for steadfastness among the saints. September 2-5, Labor Day conference in the Arlington Gospel Hall. Friday: Prayer meeting 7:30pm. Saturday: Meetings at 8:45am, 10:15am, 2pm, 7pm, 8:30pm. Sunday: meetings at 9:30am, 11:20am, 2:30pm, 7pm, 8:30pm. Monday: meetings at 8:45am and 10:15am. Breakfast (8am), lunch and supper served each day. Gaius Goff, Peter Ramsay, Bryan Joyce, and Dale Vitale are expected to share in the ministry. Bible Reading topics are “Developing an effective relationship with God, effective prayer life, effective study practices.” Accom: Jim Klein, Tel: 360 435-6611, E-mail: kleinta98223@hotmail.com; or Phil Kazen, Tel: 360 659-4166, E-mail: ps.kazen@yahoo.com. September 3-4, in Champlain Hall, Cornwallis Park. Saturday: Prayer and Ministry 10am, Ministry 2pm, Gospel 7pm. Sunday: Bible reading 8:30am (Subject: The Trespass Offering), Breaking of Bread 10am, Sunday school 1pm, Ministry 2pm, Gospel 6:30pm. Directions to the conference and the outline for the Bible reading will be available at www.clementsvalegospelhall.com. Corr: Lionel Cress, Tel: 902 467-3115. Accom: Jonathan McClelland, Tel: 902 245-8776, or E-mail: jonathan@westernvalleyagri.ca. Please contact if at all possible by August 29 to make arrangements. Limited accommodations are available in homes, so group rates have been arranged with the Conference Center for those wishing to book rooms. Due to pressures from other events in the area, rooms must be booked in advance. September 10-11, at the Hardwick Elementary School, 135 South Main St., Hardwick, VT. Friday: Prayer 7:30pm (in the Gospel Hall, 153 Cherry Street). Saturday: Breakfast 9am, Ministry 10am and 2pm, Gospel 6:30pm. Lord’s Day: Breakfast 8:45am, Breaking of Bread 10am, Sunday school 11:45am, Ministry/Gospel 2pm. Other meals provided between meetings. Accom: Bill Scott, Tel: 802 472-6257 or Cell: 802 473-0238. September 9-11 in the Gospel Hall at 475 Wellington St. East, Sault Ste Marie, ON. Friday: Prayer meeting 7:30pm. Saturday: Meetings at 10am, 1:30pm, 3:30pm, 6:30pm. Lord’s Day: 10:15am, 1:30pm, 3:30pm, 7pm. Bible readings are at 1:30pm each day (Subject: the interaction of the Lord Jesus with individuals in the first half of John’s gospel). Accom: Gilbert Belair, Tel: 705 941-8975, Hall: 705 949-1101. September 16-18, in the Arnstein Gospel Hall at 10762 Hwy 522, Arnstein, ON. Friday: Prayer 7:30pm. Saturday: Prayer/Ministry10am, Ministry 2pm, Bible reading 3:15pm (Training for Reigning), Ministry 7pm. Lord’s Day: Bible reading 8:45am (Hebrews 5: Christ as our Great High Priest), Worship 10am, Ministry 2pm, Gospel 6:30pm. For advance accommodations, call Jesse Booth, Tel: 705 757-3716. September 24-25 in the Chapman Valley Gospel Hall, 9 Miller Road, Municipality of Magnetawan, Hwy #124 and Miller Road, 18 km west of Hwy #11. Prayer Meeting on Friday, September 23, 7pm, with supper served at 6pm. Breakfast served at 8:15am on Saturday and Sunday. Saturday: Bible reading 9:45am (Subject: Prayer), Ministry 1:45pm, Ministry/Gospel 6:30pm. Sunday: Breaking of Bread 9:45am, Children’s Meeting 1pm, Ministry 2pm, Gospel 7pm. Chapman Valley Contact: Russ Longhurst, 28 River Road, Sundridge, ON, P0A 1Z0, Tel: 705 387-4393, E-mail: russandiane@gmail.com. Parry Sound Contact: Daniel Longhurst, 734 Hurdville Road, McKellar, ON, P2A 0B5, Tel: 705 389-3005; E-mail: danandjoyann@gmail.com. High School, 50 Oakwood Ave. (off High Mountain Rd. ), North Haledon, NJ. Speakers expected are Philip Coulson, John See, and Lindsay Parks. Saturday: Ministry 10am and 2pm, Gospel 6pm. Lord’s Day: Breaking of Bread 10am, Sunday school 11:45am, Ministry 2pm, Gospel 4:30pm. Two meals will be served on Saturday and Lord’s Day. Please advise beforehand of your coming. Accom: David Hamilton, 189 South Central Ave., Ramsey, NJ 07446; Tel: 201 312-8439; E-Mail: davidandjoyhamilton@gmail.com. October 1-2, in the Middle School on Doctor Street. Friday: Prayer Meeting 7:30pm (Gospel Hall 1308 N. 3rd. St.) Saturday: Ministry 10am and 2pm, Testimony 6pm. Gospel 6:30pm, Sing following (Gospel Hall). Sunday: Bible reading 9am (John 14), Worship 10:30am, Ministry 1:45pm, Gospel 4pm. Accom: Kenneth Gentz; Tel: 563 927-4662; E-mail: kensuegentz@windstream.net. October 1-2, with prayer meeting, September 30, at 7:30pm Saturday: Breakfast 8:30am, Bible Reading 10am (Godliness in My Life and the Assembly), Ministry 2pm and 7pm. Sunday: Breakfast 8:30am, Breaking of Bread 10:30am, Ministry 2pm, Gospel 7pm. All meetings held in the Gospel Hall, 1108 Fenel Road, Kirkfield, ON. Brethren teaching “the things most surely believed among us” are welcome. Contact Chad Foreshew, Tel: 705 438-3666; E-mail: crforeshew@live.ca. October 8-9, with prayer at 7:30pm on Friday, October 9 in the gospel hall, 1 Sunset Drive.All other meetings will be held in the Parkside Collegiate, 241 Sunset Drive. Saturday: Ministry 10:30am and 2pm, Gospel 6:30pm. Sunday: Breaking of Bread 10am, Ministry 2:30pm, Gospel 6:30pm. Corr: John McCandless, 5846 Boxall Rd, Port Stanley, ON N5L1J1; Tel: 519 769-2119; E-mail: johnmccandless1@gmail.com. October 8-9, Thanksgiving Conference in the Burnaby South Secondary School, 5455 Rumble Street, Burnaby. Prayer meeting Friday 7:30pm in the Victoria Drive Gospel Hall, 4659 Victoria Dr. Saturday: Bible Reading 10am, Ministry 1:30 and 3:30pm and 7pm. Lord’s Day: Breaking of Bread 9:30am (Gospel Hall), Ministry 2:30pm, Gospel 7pm. Corr: Phil Broadhead, Tel: 604 468-4979, E-mail: pabroad@gmail.com. For accommodations, please contact in advance Ben Frith, Tel: 604 931-3677; E-mail: bjfrith@hotmail.com. October 28-29, in the Wallaceburg Gospel Hall, 121 Gillard St. (corner of Gillard and Minnie Sts.). Friday: Prayer meeting 7:30pm. Saturday: Ministry 2-5pm, Testimony/Gospel 6:30-8pm. Sunday: regular assembly meetings. Meals will be served. Corr: C. A. Workman; Tel: 519 627-8743; E-mail: clworkman@kent.net, or workmancharles1@gmail.com. Brian and Carolyn Owen, 502 – 2515 Trout Lake Road, North Bay, ON P1B 8Y4, Tel: Phone 705 282-7172; E-mail: brianeowen@gmail.com. Frank Sona, 24 Freure Dr., Cambridge, ON, N1S 0A3. Tel: 519 836-6099. Battle Creek, MI: Assembly of Christians, c/o Angus K. Ferguson, 9733 Blue Heron Dr., Eaton Rapids, MI 48827. Robert Rawlings of Akron, OH, on May 2, 2016, age 83. Our beloved brother was saved at the age of 17 while attending gospel tent meetings in Ravenswood, ON. The meetings were conducted by Mr. A. Stewart of Detroit. He was baptized and received into the Lakeshore assembly. Robert moved to Akron and continued in assembly fellowship for 54 years before being called to glory. He was a willing helper in the assembly, gave help building halls, and assembling gospel texts which were widely distributed. The family funeral was conducted by family members. Robert leaves a wife and son and will be missed in the home and in the assembly. Daisy Anne Hanna of Laloma, Zambia, Africa, on May 7, 2016. Daisy was born on April 29, 1935 in Glen Ewen, SK, the third child of Joseph and Marian Hanna, and born again February 24, 1946 a few weeks before her dear mother passed away. She was later baptized and received into fellowship at Glen Ewen. Daisy trained in Winnipeg as a RN. In 1966, having a great desire to please her Lord, she left for Zambia to join her cousin, Marian Ronald, at the Laloma hospital, having been commended by the Glen Ewen assembly and West End assembly in Winnipeg (now Parkview). She was in Laloma for 50 years, and was loved by all. Besides busy hospital life, she spent many hours sewing with the African ladies and teaching them God’s Word. Due to declining health, Daisy came back to Canada several times to seek medical help, but returned in August 2015 where she was faithfully and lovingly cared for until her home-call. Daisy was preceded to heaven by her mother Marian (1946), her father Joseph (2000) and her stepmother Frances (2013). She leaves to mourn, brothers Glen (Mae) of Brandon, Jim (Dorothy) of Portage La Prairie, Melvin (Julie) of Glen Ewen; sisters Lillian (Leonard) Scammell of Winnipeg, and Doreen (Ray) Liese of Estevan, and many nephews and nieces. There were 2000 in attendance at the funeral in Laloma which was taken by local brethren and commended workers. Joan Stevenson of Orillia, ON, on June 10, 2016, age 75. Our dear sister came into contact with the gospel through Sunday school work in the old Pall Mall Gospel Hall in London, ON and the care of the Sunday school teachers there. She was saved in 1974 and brought into fellowship in 1976 in the Huntsville Gospel Hall where she had gone to work in the home of Mr. and Mrs. James Gooley. She had no family connections that took any interest in her, but the saints became her “family.” In 1995, she moved to Orillia and spent her last years in fellowship with the saints in the Dominion Gospel Hall. She was a fearless witness for her Lord and distributed hundreds of tracts to one and all. The funeral service in Huntsville was taken by Glen Cook of the Orillia assembly.